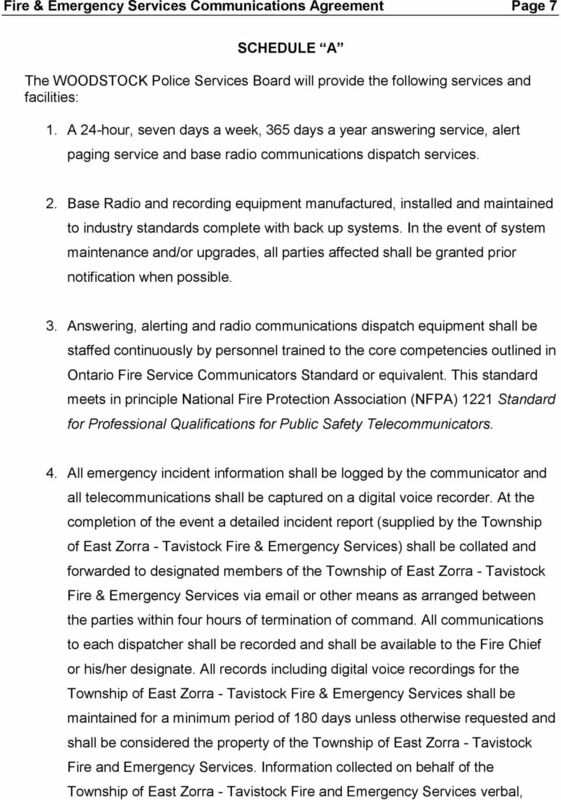 Download "THE CORPORATION OF THE TOWNSHIP OF EAST ZORRA-TAVISTOCK COUNTY OF OXFORD BY-LAW #2012-4"
3 Fire & Emergency Services Communications Agreement Page 2 Services Provided: 1. 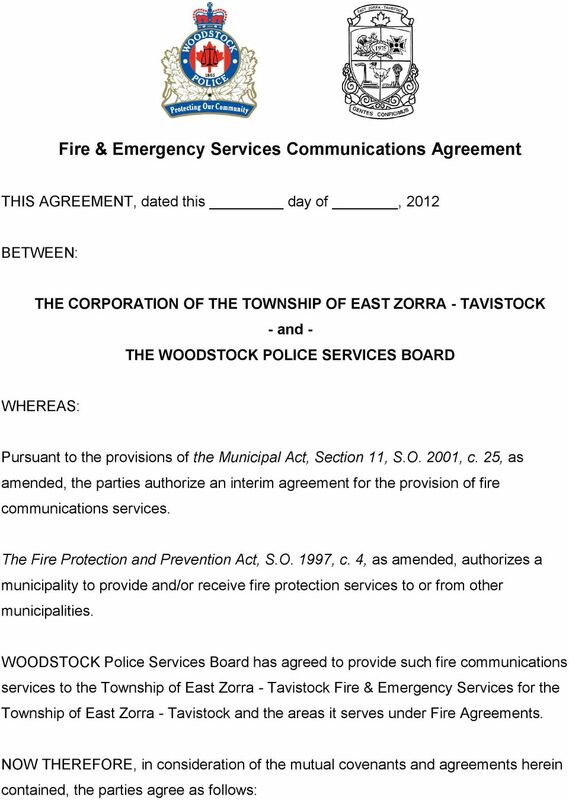 The WOODSTOCK Police Services Board will supply fire communications services to the Township of East Zorra - Tavistock Fire & Emergency Services, the particulars of which are as described in Schedule A to this agreement. 2. 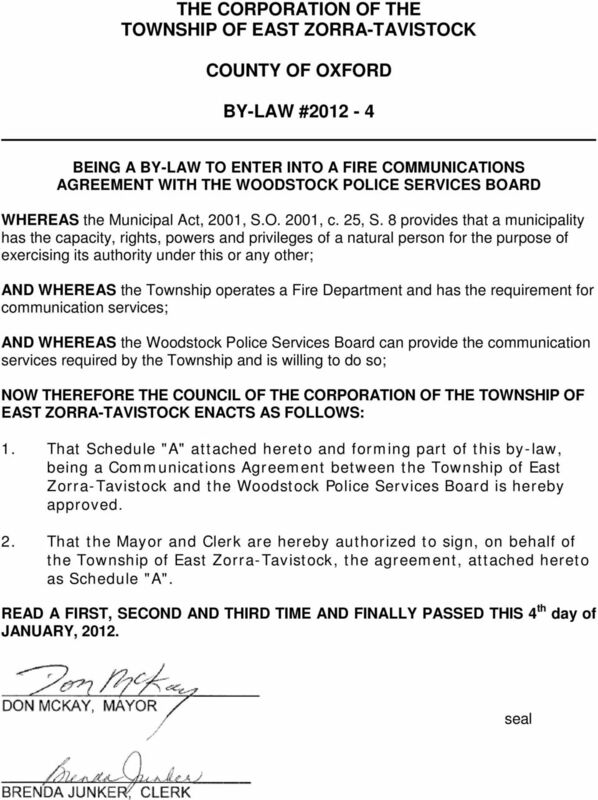 The Woodstock Police Services Board shall comply with the Standard Operating Guidelines, which regulate the operations of the Township of East Zorra - Tavistock Fire & Emergency Services. Consideration: 3. 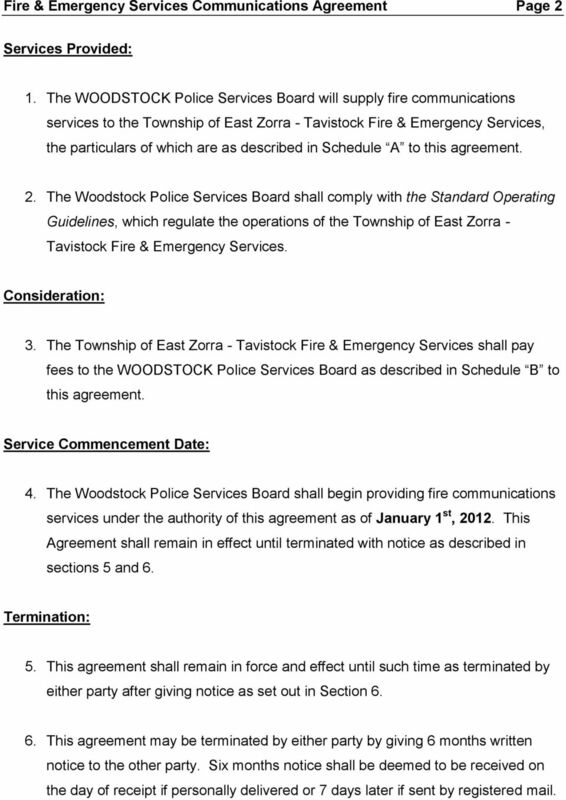 The Township of East Zorra - Tavistock Fire & Emergency Services shall pay fees to the WOODSTOCK Police Services Board as described in Schedule B to this agreement. Service Commencement Date: 4. 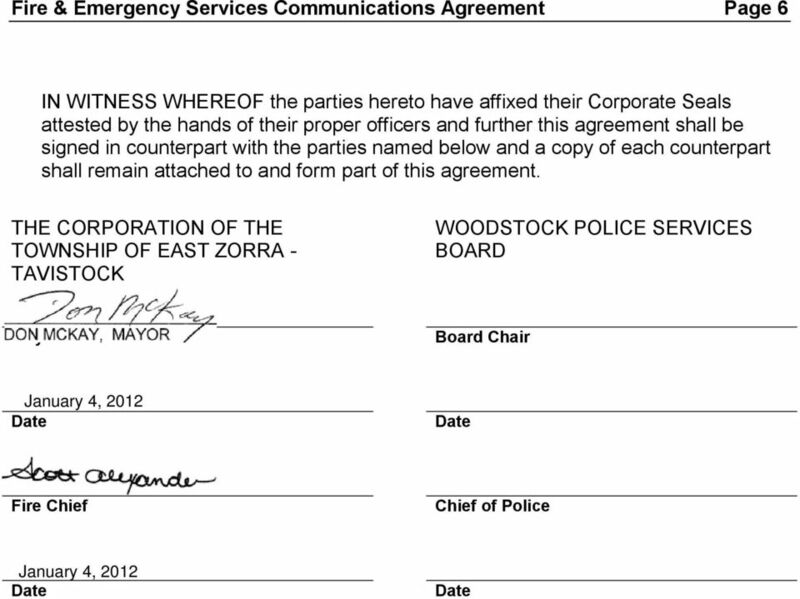 The Woodstock Police Services Board shall begin providing fire communications services under the authority of this agreement as of January 1 st, This Agreement shall remain in effect until terminated with notice as described in sections 5 and 6. Termination: 5. This agreement shall remain in force and effect until such time as terminated by either party after giving notice as set out in Section This agreement may be terminated by either party by giving 6 months written notice to the other party. Six months notice shall be deemed to be received on the day of receipt if personally delivered or 7 days later if sent by registered mail. 4 Fire & Emergency Services Communications Agreement Page 3 Indemnity and Limitation of Liability: 7. 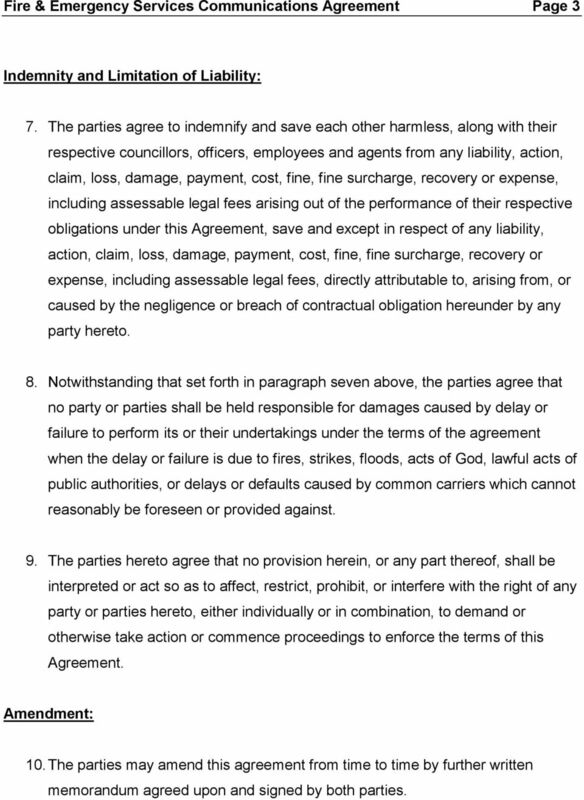 The parties agree to indemnify and save each other harmless, along with their respective councillors, officers, employees and agents from any liability, action, claim, loss, damage, payment, cost, fine, fine surcharge, recovery or expense, including assessable legal fees arising out of the performance of their respective obligations under this Agreement, save and except in respect of any liability, action, claim, loss, damage, payment, cost, fine, fine surcharge, recovery or expense, including assessable legal fees, directly attributable to, arising from, or caused by the negligence or breach of contractual obligation hereunder by any party hereto. 8. Notwithstanding that set forth in paragraph seven above, the parties agree that no party or parties shall be held responsible for damages caused by delay or failure to perform its or their undertakings under the terms of the agreement when the delay or failure is due to fires, strikes, floods, acts of God, lawful acts of public authorities, or delays or defaults caused by common carriers which cannot reasonably be foreseen or provided against. 9. The parties hereto agree that no provision herein, or any part thereof, shall be interpreted or act so as to affect, restrict, prohibit, or interfere with the right of any party or parties hereto, either individually or in combination, to demand or otherwise take action or commence proceedings to enforce the terms of this Agreement. Amendment: 10. The parties may amend this agreement from time to time by further written memorandum agreed upon and signed by both parties. 5 Fire & Emergency Services Communications Agreement Page Should any of the parties wish to amend the terms of this agreement, it shall provide a minimum of thirty days written notice to the other party of the proposed terms of amendment. Dispute Resolution: 12. In the event that a dispute arises or disputes arise between the parties which cannot be resolved, the parties shall submit the dispute or disputes to arbitration using the procedure set out in the Municipal Arbitrations Act, R.S.O. 1990, c. M- 48, as amended. 13. In the event that a dispute or disputes is submitted for arbitration, the decision or decisions of the arbitrator shall be final and binding upon the parties to this agreement. 14. 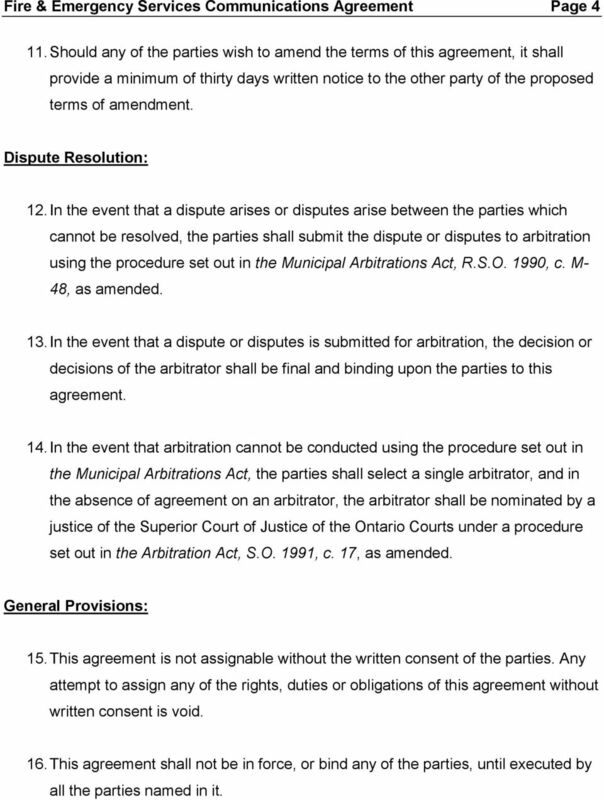 In the event that arbitration cannot be conducted using the procedure set out in the Municipal Arbitrations Act, the parties shall select a single arbitrator, and in the absence of agreement on an arbitrator, the arbitrator shall be nominated by a justice of the Superior Court of Justice of the Ontario Courts under a procedure set out in the Arbitration Act, S.O. 1991, c. 17, as amended. General Provisions: 15. This agreement is not assignable without the written consent of the parties. Any attempt to assign any of the rights, duties or obligations of this agreement without written consent is void. 16. This agreement shall not be in force, or bind any of the parties, until executed by all the parties named in it. 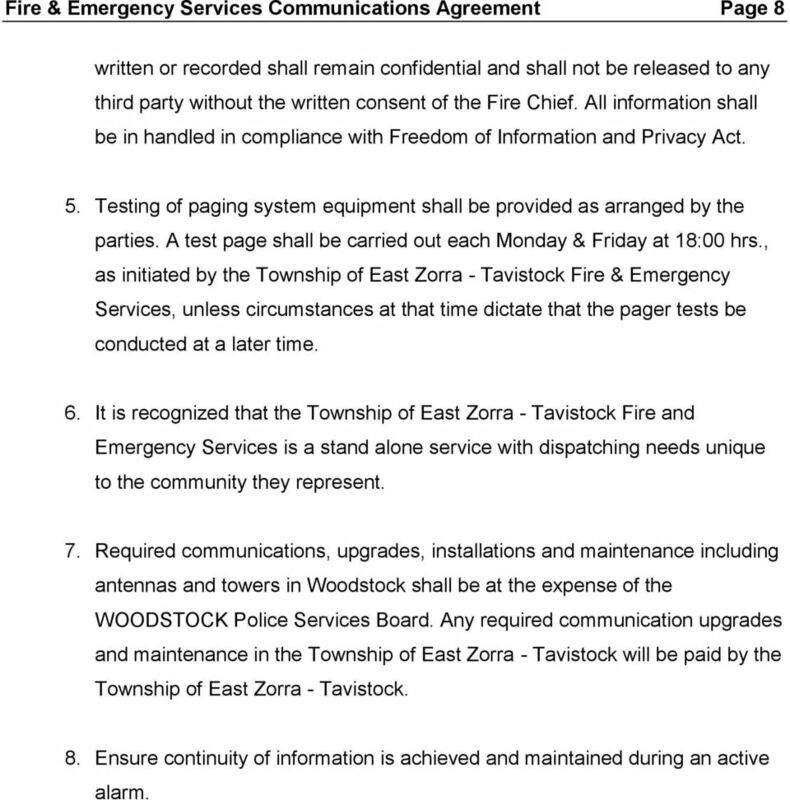 6 Fire & Emergency Services Communications Agreement Page This agreement shall take effect upon its execution by the authorized representative or representatives of the Township of East Zorra - Tavistock and the WOODSTOCK Police Services Board. 18. No change or modification of this agreement (including the schedules to this agreement) shall be valid unless it is in writing and signed by each party. 19. 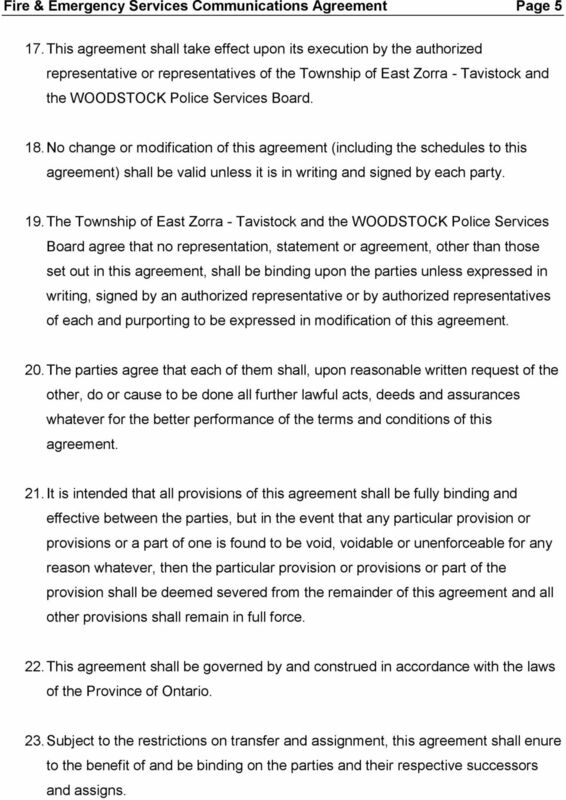 The Township of East Zorra - Tavistock and the WOODSTOCK Police Services Board agree that no representation, statement or agreement, other than those set out in this agreement, shall be binding upon the parties unless expressed in writing, signed by an authorized representative or by authorized representatives of each and purporting to be expressed in modification of this agreement. 20. The parties agree that each of them shall, upon reasonable written request of the other, do or cause to be done all further lawful acts, deeds and assurances whatever for the better performance of the terms and conditions of this agreement. 21. It is intended that all provisions of this agreement shall be fully binding and effective between the parties, but in the event that any particular provision or provisions or a part of one is found to be void, voidable or unenforceable for any reason whatever, then the particular provision or provisions or part of the provision shall be deemed severed from the remainder of this agreement and all other provisions shall remain in full force. 22. This agreement shall be governed by and construed in accordance with the laws of the Province of Ontario. 23. Subject to the restrictions on transfer and assignment, this agreement shall enure to the benefit of and be binding on the parties and their respective successors and assigns. 9 Fire & Emergency Services Communications Agreement Page 8 written or recorded shall remain confidential and shall not be released to any third party without the written consent of the Fire Chief. All information shall be in handled in compliance with Freedom of Information and Privacy Act. 5. Testing of paging system equipment shall be provided as arranged by the parties. A test page shall be carried out each Monday & Friday at 18:00 hrs., as initiated by the Township of East Zorra - Tavistock Fire & Emergency Services, unless circumstances at that time dictate that the pager tests be conducted at a later time. 6. It is recognized that the Township of East Zorra - Tavistock Fire and Emergency Services is a stand alone service with dispatching needs unique to the community they represent. 7. Required communications, upgrades, installations and maintenance including antennas and towers in Woodstock shall be at the expense of the WOODSTOCK Police Services Board. 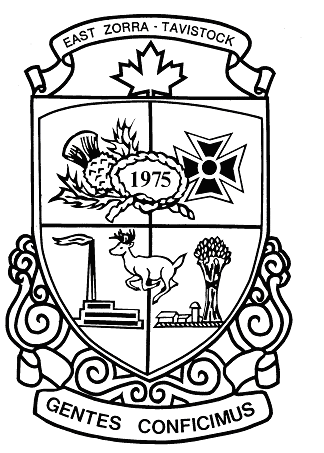 Any required communication upgrades and maintenance in the Township of East Zorra - Tavistock will be paid by the Township of East Zorra - Tavistock. 8. Ensure continuity of information is achieved and maintained during an active alarm. 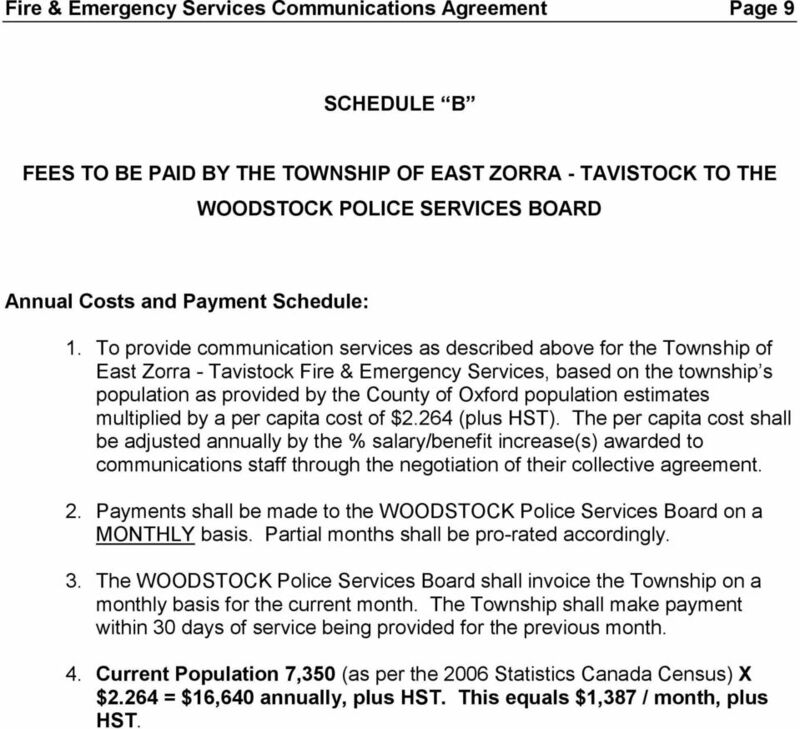 10 Fire & Emergency Services Communications Agreement Page 9 SCHEDULE B FEES TO BE PAID BY THE TOWNSHIP OF EAST ZORRA - TAVISTOCK TO THE WOODSTOCK POLICE SERVICES BOARD Annual Costs and Payment Schedule: 1. To provide communication services as described above for the Township of East Zorra - Tavistock Fire & Emergency Services, based on the township s population as provided by the County of Oxford population estimates multiplied by a per capita cost of $2.264 (plus HST). The per capita cost shall be adjusted annually by the % salary/benefit increase(s) awarded to communications staff through the negotiation of their collective agreement. 2. Payments shall be made to the WOODSTOCK Police Services Board on a MONTHLY basis. Partial months shall be pro-rated accordingly. 3. The WOODSTOCK Police Services Board shall invoice the Township on a monthly basis for the current month. The Township shall make payment within 30 days of service being provided for the previous month. 4. Current Population 7,350 (as per the 2006 Statistics Canada Census) X $2.264 = $16,640 annually, plus HST. This equals $1,387 / month, plus HST.